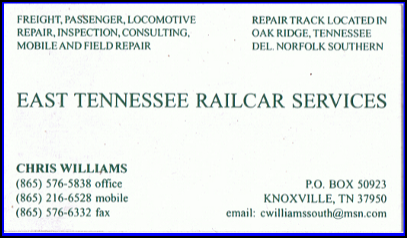 I've been doing work at the Knoxville locomotive Works for about 20 years now. Often I see the workers or owners of East Tennessee Railcar Services there. Usually I see them doing precision work on boxcars and other equipment. They have specific tools for the jobs they do; there's one just for measuring the height of a coupler, another for measuring air pressure in the brake parts . Two of his uncles spent many hours operating this locomotive, it was the first one he was on, at age 6. It was owned by Southern RR, and operated at Bull's Gap, Tn. It stayed in service many years longer than others that age because it was lighter than other locomotives, and was the only one they dared to use on the bridge over the Holston River. There is another old switcher that was used on the Young's High Bridge in Kentucky. The prime mover (Diesel engine) generates 600 horsepower. The first picture is how I saw it as I came in the shop. They're doing a lot to it, fixing electrical parts, replacing the cab floor, and replacing a cracked generator plate, among other things. It looks as though they're going to repaint it too. Notice the vintage styling of the light assembly and the curved roof. The original floors were oak tongue and groove wood, you can see a few of those boards next to the sand fill opening. Look at that styling on the sand fill door.